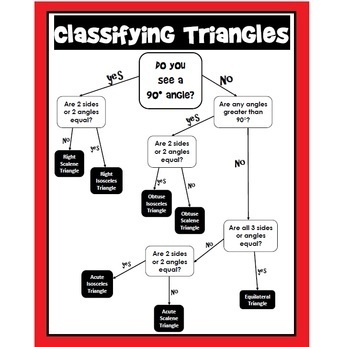 This flowchart guides the student through a series of questions to quickly and easily identify triangles. Covers right isosceles, right scalene, obtuse isosceles, obtuse scalene, acute isosceles, acute scalene and equilateral. To covert this file to a poster for free: How to Enlarge a File to a Poster!